I am a very nostalgic person. Maybe even a little sensitively so. Over the years, well before food became my main occupation, I’ve collected trivets and memories in the form of well-loved kitchen items. My Great Grandpa’s 1930′s Hotpoint Gazelle Toaster. 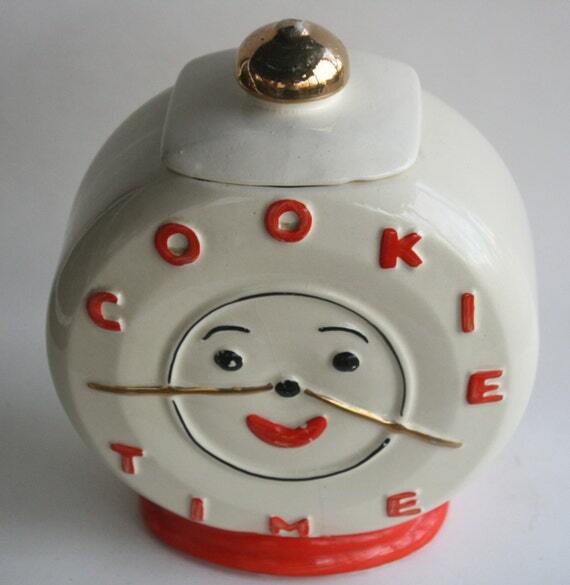 My Great Grandmothers Clock Cookie Jar. Fading sets of neutral toned pyrex bowls. Cast Irons with decades of seasoning. Well worn and revived wooden spoons. Blue and white china turkey platters? Yup. Whether it sits archived in dark closets or used on a daily basis these are the things that are special to me. These are the things which allow me to connect with those people that I have known and loved in my life. And you best believe I lose it when something accidentally breaks or it’s time has just come to pass. No one likes saying goodbye. Even to psychedelic chip n dip sets. Among my treasures is an avocado green 1970s crock pot. My mothers. I remember many years coming home from school to the inviting smells of stew, spices and stroganoff. When it was time for me to head off to college and start building a kitchen of my own, this tank came with me…and then sat in the back of many a cupboards for the next 15 years. Woops! Talk about missed opportunity. I never embraced much more than spaghetti or burritos until my mid-twenties and then was propelled into a passionate frenzy of learning how to (really) cook. Sadly the green machine remained hidden behind unused baking tins. Forgotten and archaic. Needless to say, I was in shock when I recently unearthed this time-saving meal marvel, plugged it in…AND IT STILL WORKED! 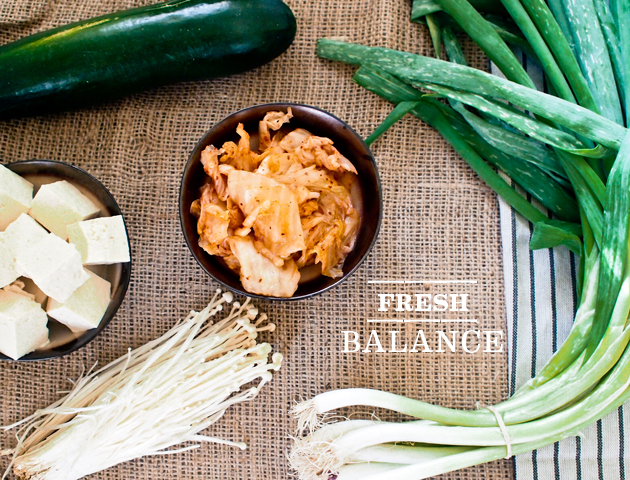 Just in time for fall and the inevitable avalanche of slow cooked feel-good meals. 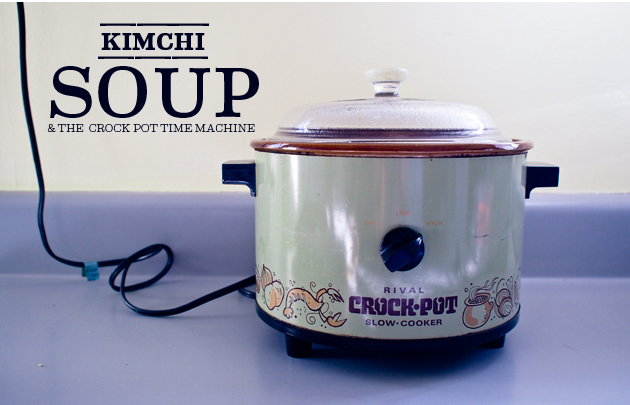 The Crock Pot Time Machine appeared and saved the day…or the soup of the day, as it were. Kimchi Jjigae is one of my all time favorite Korean dishes. 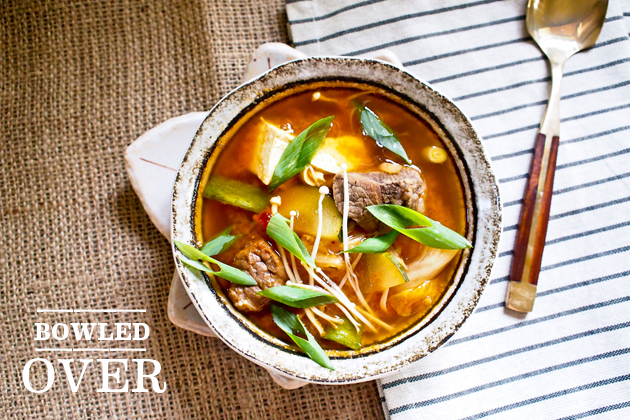 Served bubbling hot with a tri-fecta of proteins and pickled veg, it’s one of those sweet and sour soul pleasers that can cut through the coldest of evenings with a warm comforting hug and one spicy face smack simultaneously. Whoa. Rereading that last line makes it sound like a jilted lover! Not the case. It is delightful. You will want two bowls. Large bowls. This soup has the potential of taking a bit of time to prepare, especially with the need to cook the beef slow and low on the stove top for the majority of a day. This is something in need of fixing. I want this soup tonight! I want it a time table that seems impossible. …Enter Crock Pot Time Machine. Enter the ability to create a quick and easy tribute to this soup’s powerful flavors on those days when we don’t have much time to do anything other than…okay, for most days. Put your beef and this Korean BBQ stewing sauce in your stallion of a slow cooker – then forget about it while you go along on your business. When you’re back home soup assemblage is gong to be done in a snap (or 20 minutes, which ever is faster for you). Yes, I realize that most of you didn’t hide your mother’s crock pots and are years ahead of me on this ease game. Please just join me in this little happy dance of efficiency. Thank you. In a slow cooker add beef, 1/2 package Campbell’s Korean BBQ Sauce & 1/2 cup water. Cover and cook on high for 3-4 Hours or until meat is completely cooked. In a pot, add kimchi, broth, strained beef and Gochujang. Let simmer on low for 10-15 minutes. Add additional 1/2 cup of water based on flavor intensity preferences. Kimchi can very yo! Add chopped tofu and mushroom, let simmer 5-10 additional minutes. Serve with additional fresh Enoki Mushroom and chopped green onion. There is a sweetness to the Korean BBQ sauce in the stewed beef that pairs so excellently with the acidic kimchi broth, spice of the chili paste and earthy vegetables. This light and quick spin on the classic Kimchi Jjigae is definitely going to be making repeat rounds through the winter. 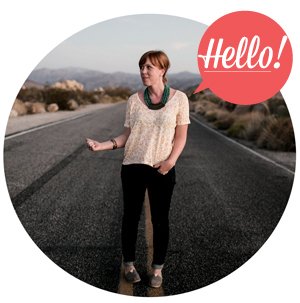 Who knew the 1970′s would come knocking on my door allowing me to create something new and equally memorable! Crock Pot Time Machine, you have opened my eyes and my calender all at once. Bless your lovely pea-green colored heart. Are you using anything old to create something new in your kitchen? This post brought to you by Campbell’s Dinner Sauces. Weekend-worthy dinners with only weekday-level effort needed! Learn more at http://www.campbellsauces.com/. Thank you for supporting these occasional sponsorships that help keep The Cuisinerd Cruise a float. I appreciate you friends…now why didn’t any of you tell me about this crock pot business sooner?! This looks so delicious. and wholesome! gotta give it a try!